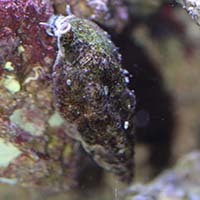 Notes: This reef safe scavenger can be found almost anywhere in the aquarium searching for food. From burrowing through the sandbed, eating off rocks and glass it has a diet of many types of algae, aquarium foods and detritus. These were the biggest ceriths I've ever gotten. All arrived alive, and began climbing and bulldozing sand as soon as they were released in the tank. The ceriths may have heat issues from the trip. Most have not moved in 3 days since arrival. Suspecting being on the delivery truck until mid afternoon, over 90 outside temp (hotter inside truck), and then when opening the shipment noticed the high temperatures inside the styrofoam packing, it was hot! Some appeared to have moved, but the majority have not. Hoping in another day or two they will recover and then survive.